Kingdom Hearts 2’s Controversial MP System Analysis – What's in a Game? Kingdom Hearts 2 has a rather odd MP System. It’s often criticized but also loved by others. Let’s talk about how it works, what’s not great about it, why it’s awesome, and how it could be made better in Kingdom Hearts 3. Magic spells cost some amount of MP. Usually around 10-20. Cure and Limits cost whatever MP you have left – whether it’s a full bar or just a bit. When MP reaches 0, it begins recharging at a percentage per second (2% default). The MP bar becomes purple during this time. When it is full, the bar becomes blue again. You can only use magic while MP is not recharging i.e. a purple bar. MP Rage can recover your MP based on Sora receiving damage. MP Haste/ra/ga abilities can increase the percentage recharged per second. As you equip more of these they stack so you can go from the default 50 second recharge time down to 18 seconds. Thankfully, Critical Mode gives you MP Hastera at the beginning of the game, which is great game design for hard difficulties. You could use an Ether or another item to restore MP. But, Sora has a limit on the number of items he can bring into battle (single digits). Entering a Drive Form will refill your HP and MP immediately. Some people feel discouraged to use any magic because they want to save it for Cure. Limits are very discouraged because you are essentially deciding that you don’t need to Cure. It doesn’t make sense that Cure takes a variable amount of MP, especially when other games don’t do this. It’s not traditional. People are used to restoring MP in other ways. Timed recharging seems artificial. Here’s the thing though: the MP System helps add several interesting decisions and challenge layering throughout the game. Why did they make the MP System like this in the first place? It prevents people from spamming Cure. 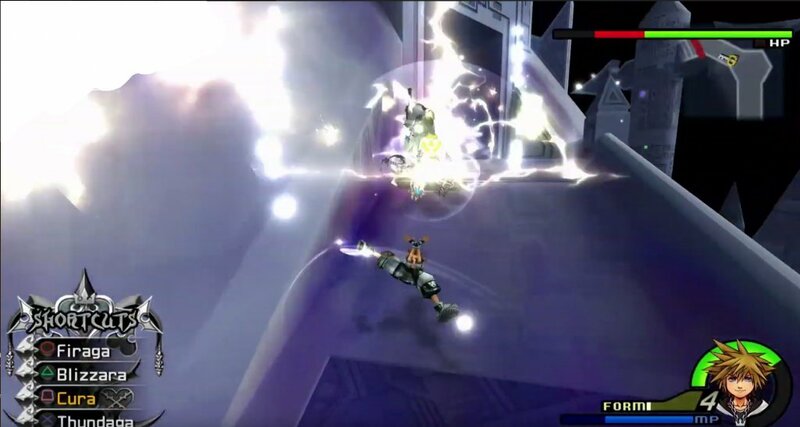 In KH1, there was a first-order optimal strategy to Attack/Cure. Attacking would refill MP so you could Cure almost anytime you needed to. The devs wanted a way around this strategy. In Kingdom Hearts 2, if you cast Cure, you have to wait some time before being able to do it again. This really makes you think more critically about when you should use it and requires you to play more cautiously afterward, but only for a set amount of time. It also prevents you from spamming Limits without adding an extra bar to keep track of. It also enables you to cast other magic abilities before deciding to use cure or limits. In a traditional MP system, you might save your MP for only healing opportunities. Some players in KH2 are more likely to use magic in anticipation of not wanting to waste all their MP. They might say: “Oh I need to cure, but let me use some magic first so I don’t waste all my MP.” This thought makes them play riskier and play around with magic they might normally use. They can still choose to use Cure now if they don’t think it’s worth the risk in the moment, so it’s a small example of challenge layering. Drive Boost causes the Drive Gauge to sparkle when MP is recharging. It encourages risky play. When a player’s drive gauge isn’t full, players are encouraged to deplete their MP and continue attacking to increase their drive, putting them in riskier situations without being able to Cure. This helps a complaint about the MP system – that people can just run around avoiding damage until MP is restored. Drive boost gives you a reason to attack more while you are recharging. It encourages using magic/limits to drain the MP gauge. Players might use magic they wouldn’t regularly use (like Magnet or Reflect) which will help them learn more advanced mechanics as and have more challenge because they are using abilities they don’t normally use. It’s up to the player whether to be risky in each moment. Players can choose in the situation whether it’s worth it to them to focus on the drive boost or safety. The reward for utilizing drive boost (activating a drive form and leveling up the drive form) is not direct positive feedback – meaning it doesn’t make it easier for you use drive boost later. This is what we want because we don’t want it to be too easy to abuse this ability. Players get into their drive forms more frequently, increasing engagement. Not only are drive forms fun to play in and give some variety to the combat, but they often limit what abilities you can use, too. I’ve died a lot in Valor form because I couldn’t cure. Personally, I found myself deciding to drain my MP, either by using magic or just curing, then attacking. I died sometimes, but it was fun because I wasn’t just mindlessly grinding. I had layers of goals: Main goal: Level up drive form. -> Go into drive form. -> Gain drive as quickly as possible. -> Deplete MP and attack. Let the player choose if they want Cure to take all MP or not. It could be an ability they equip that gives them some reward. Then, they can decide before battle if it’s worth it to limit how many times they cure. This would alleviate most problems people have with the MP system, while still enabling the advantages of it for high-skilled players. Give more of a reason to use and experiment with magic and limits. KH1 and KH2 both have a problem where there’s not much reason to use mechanics besides attacking and curing. Kingdom Hearts 0.2 shows us there are ways to increase experimentation with the existing MP System. Give a reason to play riskier if out of MP by default. Equipping Drive boost solves this, but I think this should be a default property of the game. You could also imagine an ability or property where attacking recharges MP faster. KH Birth By Sleep switched to using a command deck which fixes a lot of the problems while maintaining advantages. Cure doesn’t inhibit any other abilities because each command has its own refill timer, plus the player can choose how defensively they want to play by deciding how many cures they want to equip at once. KH 0.2 A Fragmentary Passage also expanded on the system which gives us a sneak peek to Kingdom Hearts 3. Kingdom Hearts 2’s MP System has some flaws but overall it’s great at providing players with interesting decisions and challenge layering in the heat of battle. Here’s hoping Kingdom Hearts 3 expands on this wonderful system!